Oh dear! I have been thinking for a while now that I’ve fallen a little bit behind here but I genuinely had no idea that it’s 6 months to the day since I last wrote…shame on me. How we got from February to halfway through August in the blink of an eye is beyond my comprehension but here we are with just two weeks left of the peak season and luckily my head is still above the water, if only just! Yes, it’s been a balmy 6 months , in all senses of the word. February to May was one wild whirlwind of finishing touches to La Tour de Genèbre – it was a bit manic but we got there in the end and have been fully booked since we opened (next availability is 27th September) so it was worth the blood, sweat & tears. We’ve had a fantastic response from our first year’s guests and a few lovely 5 star reviews too which adds to the warm glow …thanks everyone, much appreciated!! The burning topic of conversation this season though has undoubtedly been the weather. Hot, hot, hot !!! 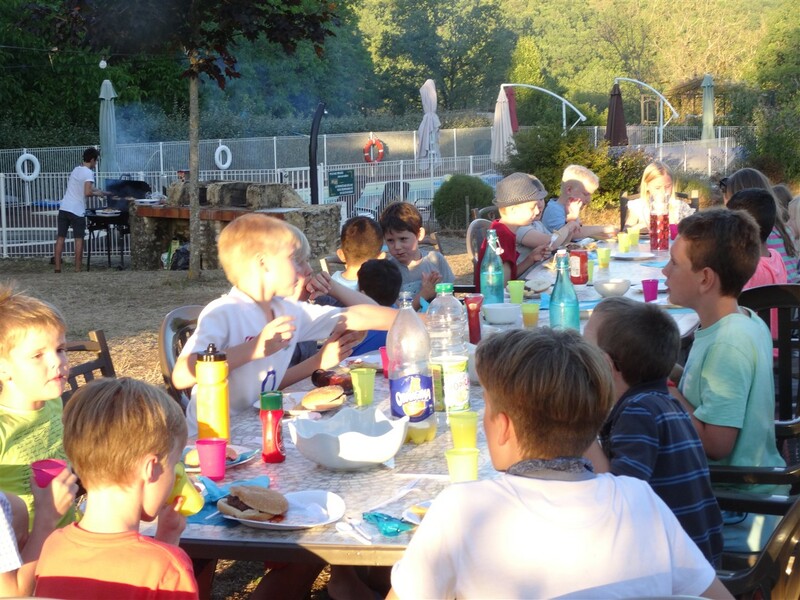 Which was great … after all that’s what you want on holiday,n’est-ce pas?? But our usual quota of flash thunderstorms to clear & freshen the air just didn’t happen this year. 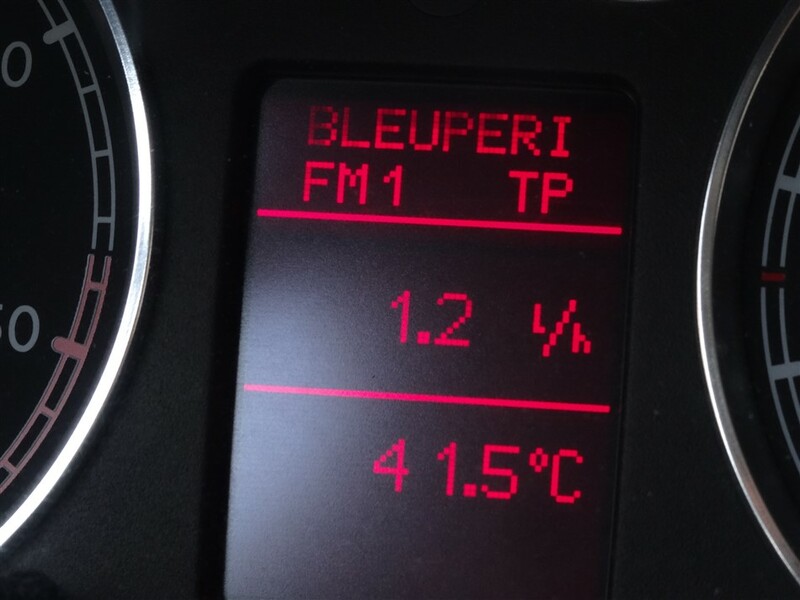 Daily temperatures exceeding 40°C were not unusual and often the nights were still hovering around 30°C. 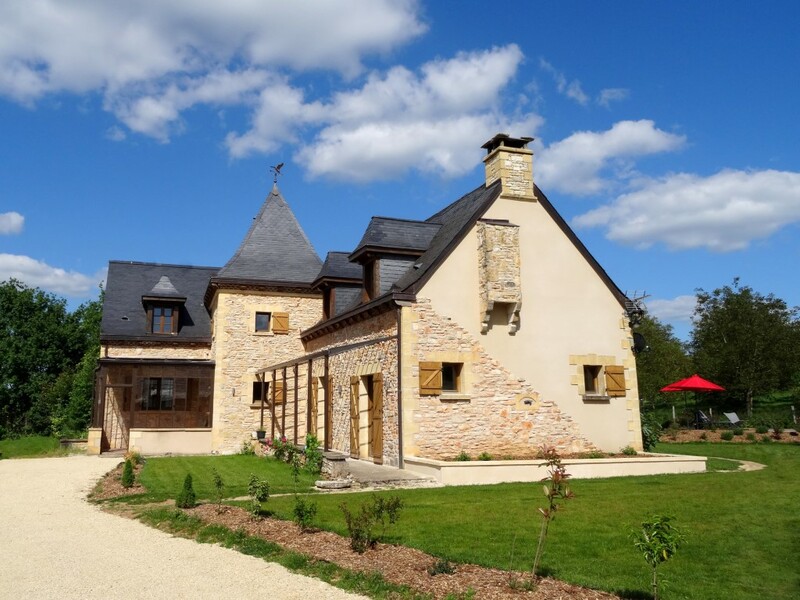 I spent many of those balmy late nights/early mornings ferrying our two very sociable teenagers around, as you do when you choose to live out in the French sticks. I quite liked those little jaunts, meandering along the dark country lanes at 2am with the windows down, driving just fast enough to whip up the tiniest of breezes, but trying to sleep indoors was quite another kettle of fish. I was actually beginning to daydream about spreading lots of mattresses around the football pitch straw field and giving people the choice to sleep al fresco. The pitch & putt course took a huge hit. We couldn’t water the greens as all the rain water ran out in June. Amar was heartbroken, unable to do anything except stand by and watch his pride & joy wither before his eyes. Each new set of guests who arrived was treated to a spectacular show as he frantically rain danced his way up and down the course. They all sympathised of course – seeing the parched and arid straw coloured field (no greens to be seen) how could they not? They all wished him well in his quest for rain ….but not until their two weeks were up. In the end they all got their wish – it didn’t rain until mid August. 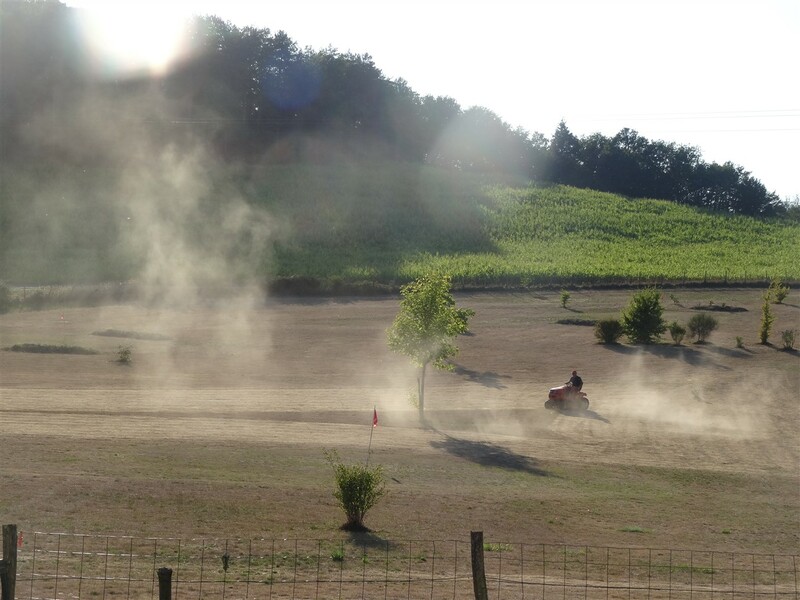 In the meantime all he could do was mow down the weeds which seemingly can still flourish with no water at all – the only flashes of green in our now yellow & brown landscape – covering everything in huge clouds of dust. It didn’t stop the diehard golfers though who embraced the new challenge, adapting their game to stop the golf balls ricocheting off the rock hard earth! On a positive note the washing was hung out & brought back in within 20 mins, all the usual chores were put on the back burner (no mad dogs or Englishmen in this household 😉 ) and we had a bit more time to get out & about this year. 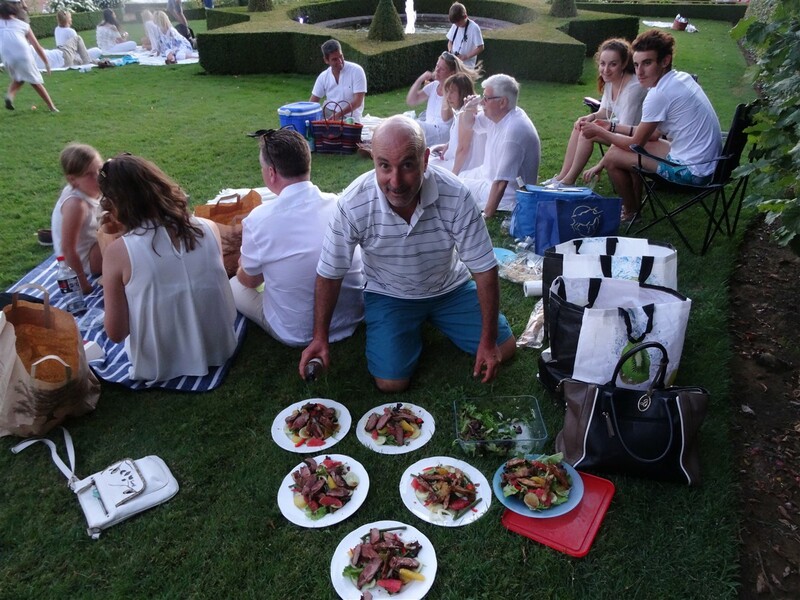 We discovered the delights of the White picnic at Les Jardins d’Eyrignac. Every Monday night in July & August the entry fee also includes an invite to the White gardens for a picnic, music & fireworks. 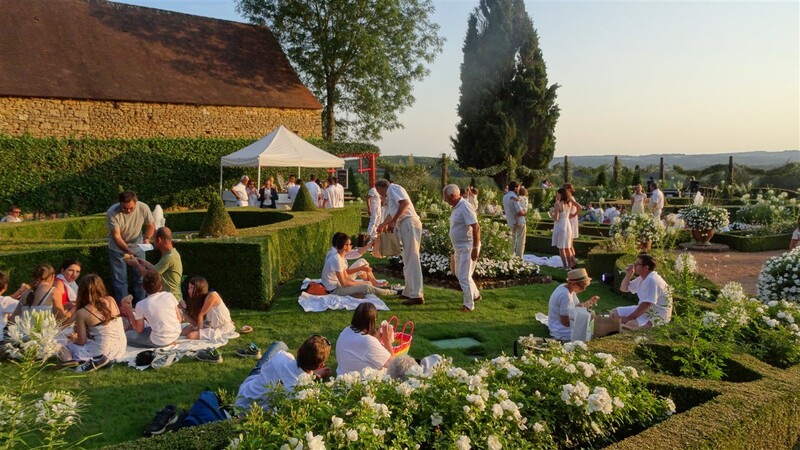 Everyone is asked to dress in white (as best you can) and either bring your own picnic or buy one from them. It’s a wonderful atmosphere with all ages from babies to grandparents. We have had more than our fair share of music festivals and street shows this Summer. 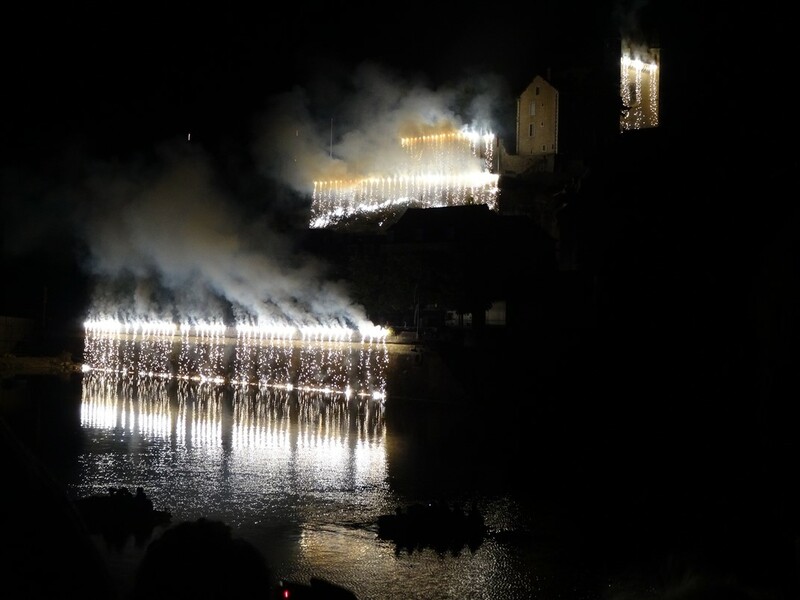 Terrasson has been the venue for some interesting events. The 3 day street theatre in July was an excellent extravaganza of music and light…following the scary masked entertainers around the back streets of the town as they threw fire and drove the crowds into a frenzy was great fun if all a bit surreal! The Bastille Day celebrations were fantastic as usual with the best fireworks in the area in our opinion. This firework waterfall never ceases to draw gasps of delight from the audience and this year it was set to Ave Maria….all very emotional!! Those people on the river had the best seats ever! 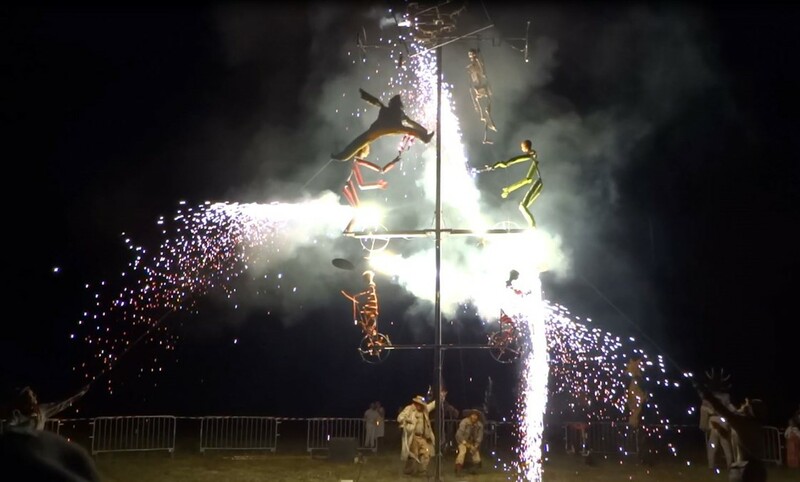 I decided to film it this year but somehow managed to press the stop button before the end….you really had to be there to soak up the atmosphere but still, here are 39 seconds of a delightful show!! 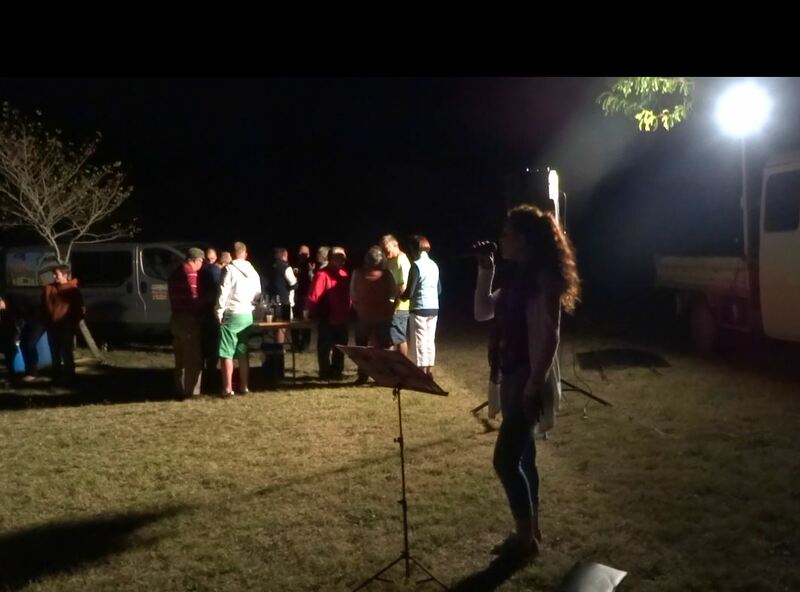 I didn’t have much time to film last time so here’s Emma singing at someone else’s gites a couple of weeks ago. Add in several other musical outings, a few restaurants as well as some local events ( I will write about these later when time permits) and it”s probably not hard to see how the time has just flown by … as it does when you’re enjoying yourself! I’ll be back ( hopefully before the year is up 😉 ) to tell the rest of the story….. Bonne continuation à tous!! Well done on making Les Crouquets such a wonderful place. We know only too well all the hard work that goes into it. Thank you Ken & Elizabeth! Hope you are both well! We’ll look forward to that Roger …always a pleasure to see you all!! Great to hear all your news Elena and strange that I should also write my first blog post for seven months just yesterday too! Lovely post – great to catch up on your busy six months. My heart goes out to Amar – our minute patch of lawn has been struggling with the temperatures too. PF was inches from getting us all to spit on it daily. W’ve had a few storms now – how about you? Woke up to blue sky again this morning… bring it on, Autumn!